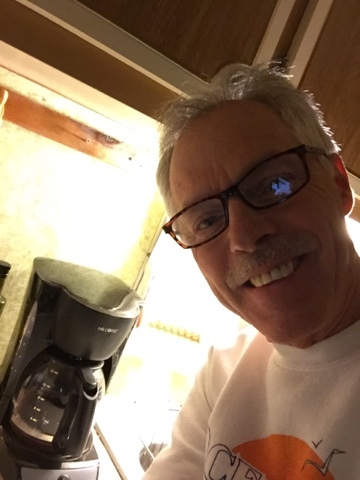 Here I am bonding with Mr. Coffee. Then it's bacon and sausage and eggs with toast for the crew. This morning I take Mom to the doctor and then my brother this afternoon. Mom and I will visit Dad's and my sister's graves this morning. She wants to put some of our favorite Christmas ornaments on each site, which I think is both thoughtful and creative, sweet too. I got all choked up when she was explaining her idea. My laugh yesterday was that I couldn't find a bag of clothes that I store here. Then when I was helping Mom with the ornaments (She got them out of the closet herself. I found her halfway through the project. ), I saw a paper sack. "Oh, just some old clothes I'm going to throw away. " It was my lost sack of clothes. Mom and I laughed at that. It looks like there's a good chance Mom will be coming to Iowa to live with us and the family. We just have to get my brother able to get along on his own. I wonder what adventures today's day out with Mom will bring?